Featuring a double 1-piece molded design, the Mustee, E. L. & Sons, Inc. 46 in. x 34 in. 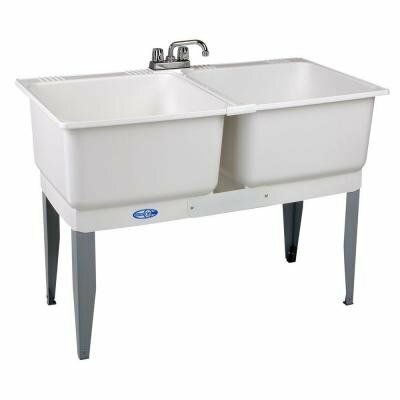 Plastic Laundry Tub features heavy-gauge steel legs with levelers and stoppers for sturdy installation. The 20-gallon capacity tubs have leak proof, integrated drains and smooth, mildew resistant surfaces that are simple to clean. A ribbed underbody provides added strength and support. These tubs include everything needed for setup and installation.